A panoramic view of the lake along South Road by Glen Brook Farm at Roundtop, NY, a favorite shooting location for our three-season visits to the Catskills. If you click on the above image you can see it full size. I recently spent a fun weekend with fellow photographers in the vicinity of Round Top, NY, staying at the Glen Falls House as a base, and venturing into surrounding areas, chasing the light. The group included shooters from the South Jersey Camera Club, the Cranbury Digital Camera Club, and the Ocean County Camera Club. As in the past the locations were pre-scouted and the group led by SJCC photographer Denise Bush. Having been up there in several previous seasons I tried to find new scenes or perspectives as did others. Looking at some of their creative-eye results I am frequently left wondering “Why didn’t I see that?” But, that’s part of what makes it interesting. Click here for some additional images in one of my galleries. The Glen Brook Farm lake (the pano above) has frequently been a first stop. 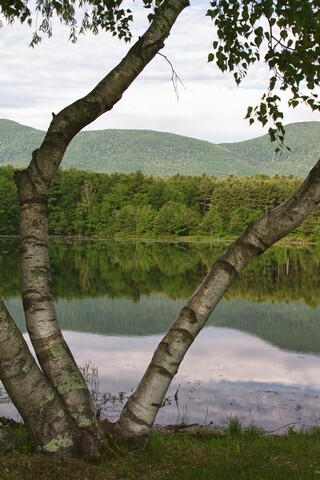 It’s a beautiful spot with birches and willows and — viola — the Catskill mountains. Here are two scenes on which my mind’s eye focused. Another place we visit is the All Souls Church. 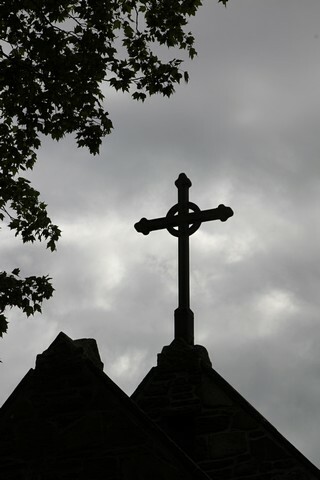 Because of a blah sky and too much contrast between the church and the sky this image will be useful as a Gothic novel cover. Another favorite spot is the mountain-top mansion of Frederick Church, a principal figure in the Hudson River school of landscape painters. The mansion, called Olana, is named for a fortress-treasure house in ancient Greater Persia (modern-day Armenia), and incorporates Persian, Moorish, and Victorian architecture themes. The different view this visit: the Coreopsis in the meadow below the house. Off then to other pretty scenes. Below is Bastion Falls which I had only previously photographed from Route 23 which passes it between Palenville and Haines Falls. This time we climbed down into the path of the water under a Route 23 bridge. There wasn’t much water flowing so we could do this and it provided a great perspective. In another field which beckons us every trip I walked out and into a grove of birch trees. 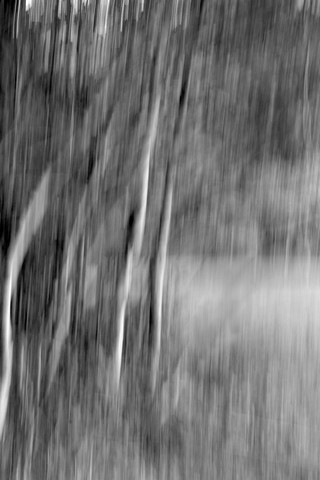 The scene below was captured by moving my camera vertically with a 1/3 second shutter speed. I then converted it to black and white. 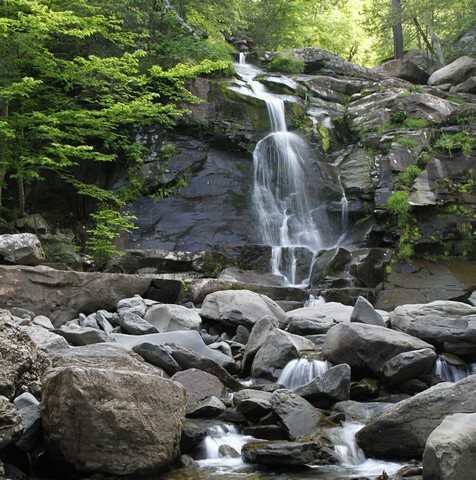 At Bastion Falls I found the sight and sound of the falls so restful that I recorded a minute of it. It helps me recapture the feel of the moment. Please enjoy some of it. Really well done photos and interesting views. As you stated, I wonder why I didn’t see that. Great job Ralph! 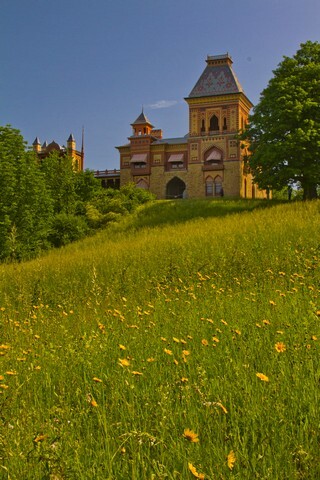 I like the willow reflections and hilltop view of Olana. Thanks, folks, and thanks Denise for getting us all up there again. Very well done Ralph! The photos are beautiful. The sound of water… waterfalls,ocean waves and rainfall have the same effect on me. Really like the Olana shot and pano. Its great to have Denise’s dedication to the group and especially her scouting for the trip… kudos!!! A wonderful series of photo’s Ralph. 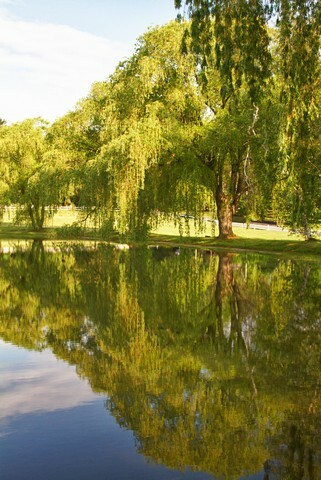 I love the Willow Tree reflection. Even though we were at the same places at the same time I can honestly say your have gotten a lot more interesting points of view and some really nice compositions I did not see. Well done! Thanks, Laura. I don’t know if you had noticed but your site, Somewhere in NJ, is on my blogroll because I always enjoy your commentary and your images.